Stock light output not strong enough for you? Looking for a brighter, more vivid look? 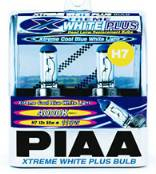 Upgrade your stock VW bulbs with PIAA's very popular Xtreme White Plus technology bulb. Rated at 4000K and providing nearly twice the wattage of your stock bulbs these bulbs will provide a brilliant cool white light that will light up road hazards and street signs long before a normal halogen bulb, giving you a more classy look and better road safety. Star White bulbs are significantly whiter and brighter than normal halogen bulbs. The Star White bulbs operate at 3800K while normal halogen bulbs operate at 3200K. Star White bulbs feature PIAA’s exclusive XTRA Technology, which increases bulb performance without using more of your car's electrical system. PIAA Star White Bulbs can be used to upgrade performance in headlamps, fog lights, driving lamps and many other applications, throughout the vehicle.